Bertram is a very handsome crow that lives on our street with his wife, who is so shy that I still don't know her name. Each morning and each afternoon he lands on the power line that goes from our house to the power pole across the street and patiently waits for me to realize that he has been patiently waiting. He always gets peanuts in the afternoon, but in the morning I sometimes give him cornbread, which he loves so much he almost falls over himself to get it, or rye bread, which he can barely choke down. This morning when I went outside, the poor nameless yard squirrel was sitting on his haunches, expectantly waiting for something edible to fall on the ground. He looked so adorable sitting there that I couldn't resist giving him a two VERY small pieces of "Bertram's" rye bread. This infuriated Bertram, who ignored the pieces of bread that I balanced on the top of the railing posts next to the front steps for him. 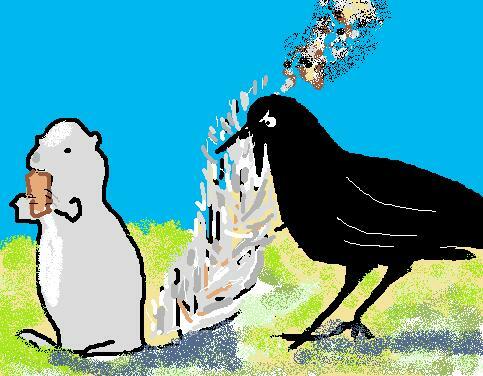 Instead, he swooped down to the ground behind the squirrel, grasped some of its tail hair in his beak, and pulled. The squirrel whipped around, and Bertram quickly hopped back out of reach. When the squirrel began nibbling his bread again, Bertram again pulled his tail. This sequence was repeated until the bread was gone and Bertram lost interest. Bertram then flew over to the railing to choke down some rye bread. About halfway through he started making an unusual clicking sound, followed by something that sounded like a chuckle. He did this over and over until I became so concerned, I put some fresh water out for him. Maybe he really was choking on the rye bread. He ignored the water, but instantly regained his "Caw" when he saw another crow flying too near. I came inside and read up on crow noises. Apparently this is one that they make, and not when they're choking. Maybe it's their version of a laugh. I was certainly laughing about the squirrel episode. Maybe he was too. PS Someone recently asked me if I made up this story. Nope. It's completely true. Crows are surprisingly intelligent and, believe it or not, they share a lot of social traits with humans. In fact, their social behavior is closer to humans' than any other species on earth. If this interests you, see the PBS video, "A Murder of Crows." Also, I just found this video of a crow pulling a dog's tail: http://www.huffingtonpost.co.uk/2012/08/01/cheeky-crow-creeps-up-on-dog-and-bites-him-on-the-tail_n_1727071.html.